Diabetes causes uncontrolled high blood glucose (sugar). Monitoring blood glucose every day is an important step to managing blood sugar. Another test used to assess blood sugar control is the hemoglobin A1C test. This test measures how much glycosylated hemoglobin (also called hemoglobin A1C) is in the blood. Hemoglobin A1C is formed when blood sugar sticks to hemoglobin of red blood cells. As blood sugar levels rise, so do levels of hemoglobin A1C. Since red blood cells live for about 3 months, the hemoglobin A1C level indicates how well blood sugar has been controlled over the last 3 months. Hemoglobin A1C should be measured at least twice a year if you have diabetes. However, if your blood sugar is high or your diabetes medication regimen is changed, your doctor may want to measure the hemoglobin A1C more frequently (every 3 months) until your blood sugar returns to an acceptable range. The hemoglobin A1C is an accurate way to measure how well your diabetes treatment plan is working. It provides information about the average glucose level in your blood over the last 3 months, and it does not show daily fluctuations. When blood sugars are consistently high over time, the hemoglobin A1C will also be high. When hemoglobin A1C is high, changes to your medication or lifestyle (exercise or diet) are needed. To measure hemoglobin A1C, a blood sample needs to be obtained. Blood is collected into one or more small vials labelled with your information. 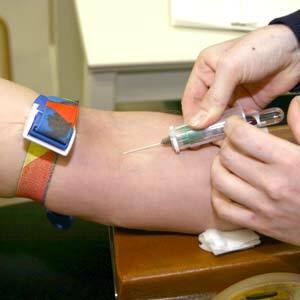 To draw the sample, a technician or nurse wraps a wide elastic band around your upper arm to help locate the vein. Once the vein is located, usually on the inside of your elbow, the area is disinfected using alcohol swabs. The technician inserts a needle into a vein and pushes a vial onto the needle to collect the blood. The elastic band is removed and after the blood is collected, the needle is removed and discarded. You will have to hold a small piece of cotton over the area until bleeding stops. A small bandage will be applied to hold the cotton in place. The test is almost painless for most people, although you may feel a slight pinch when the needle is inserted. The vials of blood are then sent to a laboratory for analysis. You do not need to fast or change your diet for this test. Slight tenderness may occur where the needle was inserted. Hemoglobin A1C is recorded as a percentage. In general, for a person with diabetes, the target hemoglobin A1C is 7% or less. Levels 7% or less may help reduce the risk of complications associated with diabetes such as kidney disease, eye problems, nerve damage, and need for amputation. Your doctor may recommend a slightly different target depending on your age and other conditions. For example, the hemoglobin A1C target for children less than 6 years of age is less than 8.0%. Ask your doctor when your test results should be available. Talk to your doctor about your results so you understand their significance.